What Can You Expect From The Demolition Process? When most people think of a demolition process, the image that comes to mind immediately is the big wrecking ball destroying everything in its path. However, that is not the only part involved in a demolition – there are actually a number of steps your demolition team will take before they even reach that stage. Today, we are going to explain the five main stages of the demolition process, along with how to deal with any unforeseen problems that may occur. Firstly, what does demolition actually involve? 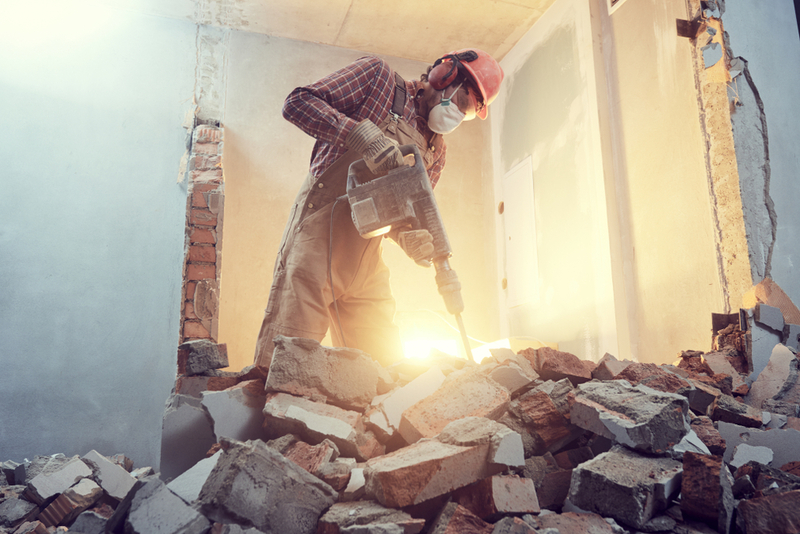 According to Safe Work Australia, demolition encompasses any activities related to those in which you “demolish or dismantle a structure or part of a structure that is load-bearing or otherwise related to the physical integrity of the structure”. This does not apply to dismantling structures that have been used to aid construction work (such as scaffolding). It also does not apply to the removal of telecommunication, light, or power poles. It should also be noted that it is a legal requirement to determine whether asbestos is present on the demolition site, for the safety of those accessing it or those who are nearby. Planning what you’ll do with leftover materials is something that needs to be done before the demolition phase as well. Salvaging: You should try to salvage as much as possible before the demolition phase if items (such as chairs and tables) are still usable. Salvaging doesn’t necessarily mean you need to keep the items, either – you can easily donate them to charity shops or friends who might be interested in them. The key is to ensure the items are still in the appropriate condition for usage. Recycling: You might come across items that are not appropriate for further use, such as old computers or hardware that doesn’t work anymore. In this case, you need to research whether or not it can be recycled. Landfill/Pickup: You can often easily organise hazardous materials to be picked up from the site. Some examples of potentially hazardous items include old batteries, spare paint, and leftover cleaning supplies. Aim to have a pickup day allocated to clear out all items that pose a potential risk to everyone on the site. For non-toxic items that cannot be recycled or salvaged, your last option for disposal is landfill. The next step in the process is all about implementing measures of risk control. In some cases, there may be a few control methods that are applicable to the site. In this situation, the applicable control methods should be assessed and ranked from the high to low in terms of protection and reliability. This ranking process is also known as the hierarchy of control. The control method that is always at the top of the hierarchy of control is elimination. Therefore, eliminating a risk entirely should always be the aim when undertaking risk control. This may involve, for example, contacting environmental consultants to remove asbestos risks. Substitution, which involves replacing a given step or detail in the demolition process with another, less risky, step or detail. For example, in the situation where a mechanical demolition is safer than manual demolition, risk control would involve substituting for the safer option. Isolation. This is more to do with protecting surrounding structures or any pedestrians that may be nearby. Using isolation to control risk may include using concrete barriers to separate pedestrians from the demolition site, for example. Engineering controls. Safe Work Australia gives the following example of engineering controls: “[fit] an open cab excavator with a falling objects protective structure to minimise the risk of being struck by a falling object”. Administrative controls. Any remaining risks should be minimised by using administrative controls, such as placing appropriate signage around the demolition area to warn workers or pedestrians about any risks. Protective equipment is the final step in risk control. This involves providing workers or those accessing the site with personal protective equipment (or PPE), such as hard hats and high-visibility vests. Before the demolition, a detailed demolition plan will be made to identify any risks that could be caused by the demolition itself. It will also include details such as the length of time the process is expected to take, the distances between the building and surrounding structures, and what method of demolition the team will use. Generally speaking, there are two methods of demolition: explosive and non-explosive. When the building falls to the side. This method is used when there is a lot of free space available on the demolition site. Steel cables are fixed to the side of the building that is set to fall, which ensures it falls in the right direction. When the building falls onto itself (building implosion). When there is not as much space beside the building, the explosive demolition is set up so that the building falls onto its own base. This means that the buildings next to the one being demolished won’t be affected. Sledgehammer: A sledgehammer is primarily used to demolish small walls or single columns, as it is a handheld tool. Bulldozers: Bulldozers and excavators are used to dig up the soil and move debris out of the way on demolition sites. High-reach excavators: This machinery is used for buildings that are too tall for explosive demolition. Wrecking balls: Steel wrecking balls are attached to cranes in order to target tall buildings as well. However, this machinery is not usually used due to the lack of control in terms of ball trajectory – whereas high-reach excavators are more targeted. Sort through debris. Any debris that is recyclable needs to be sorted and separated from other debris that needs to be disposed of. Recyclable materials often found at a demolition or construction site can include wood/timber, steel, concrete and copper. Remove signage. Any signs, temporary barriers or fencing, and sectioning tape also need to be removed from the demolition site. The site and surrounding area should be assessed one last time to see if any potholes need to be filled or if anything needs to be repaired. Don’t exclude the car park where all the demolition machinery is, either! Often, the constant traffic and dirt can mean the lines need to be repainted. Once the debris has been appropriately sectioned, it is time to dispose of it. Again, this can include recycling, rubbish pickup, excavators or even selling metals. Without a doubt, it is imperative that you have environmental consultants assess your site in step one and two of the demolition process. Not only can they detect deadly substances such as asbestos and paint containing lead, but they can also remove them safely from the site. Having a professional consultant review your site is the only surefire way to ensure you are meeting your legal responsibilities while keeping everyone onsite (and offsite) safe. Alpha Environmental are environmental consultants that can help make your demolition process a safe one. We are experienced in identifying and removing hazardous materials at a quick turnaround. Our experienced staff is comfortable conducting thorough audits of all kinds of sites, big and small. After the audit, our staff can provide recommendations and advice for maintenance and/or removal of any hazardous substances. For an obligation-free quote, call Alpha Environmental today on 1300 039 181.